Just asking silly questions about things that really don’t matter. I mean sports aren’t life or death, right? Although some might argue that, I do agree they provide a often much needed distraction from the seriousness of life. Thinking about the Dallas Cowboys tonight as they play the New York Giants. A silly little haiku to go along with the two colored pencil drawings I did many years ago for my wife. She is a huge Cowboys fan. After a great start so far to the season, maybe this is the year the Cowboys return to prominence? 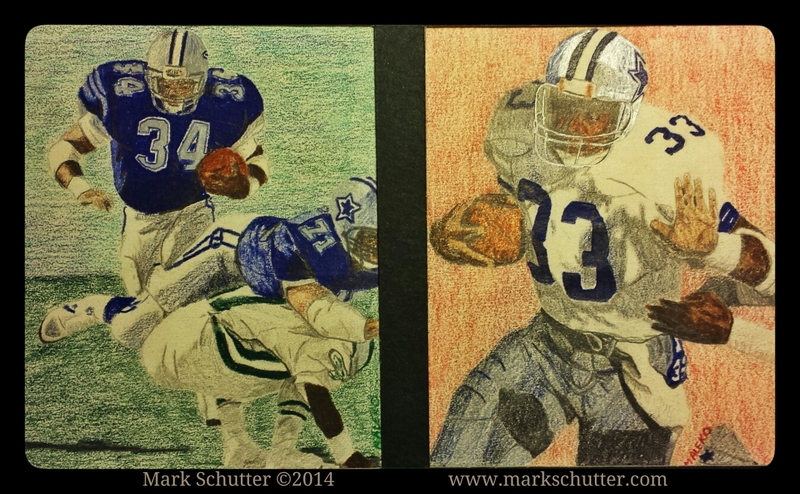 This entry was posted in Art, Poetry and tagged Art, Dallas Cowboys, drawing, football, Haiku, Herschel Walker, Micropoetry, New York Giants, NFL, Tony Dorsett. Bookmark the permalink.